Well, here it is. The review that many have been waiting for – the legendary New South Wales Ginger Nut. New South Wales? That’s right. Arnott’s actually bake four different varieties of Ginger Nut that are available in different states. This is because Arnott’s used to have bakeries all over the place, and each bakery produced a slightly different product. Arnott’s subsequently consolidated all its manufacturing into one plant in NSW, and hence started shipping the NSW Ginger Nut all across Australia. The result? Uproar. Outside of NSW people took to the streets with placards, there was looting, civil unrest – for a while it really did look as if the veneer of civilisation was slipping away from Australian society. Australians were simply not happy that someone could mess with their ginger nut. The Governor-General intervened and called for a truce, and Arnott’s agreed to continue to bake the different varieties that people were used to. And so, to this day, Arnott’s bake four different versions of the Ginger Nut and ship them to different states according to local tastes. In a future review we shall return to this theme, and do a comparison of each of the different types. However, this review focuses on the NSW variety; and in so doing perhaps gives an inkling as to why there was such consternation when the NSW Ginger Nut hit the shelves and palates of people unused to them. 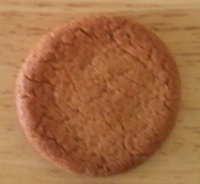 On the surface, the biscuit looks fairly ordinary; quite thin and round. It smells appropriately gingery, and all looks fairly normal. However, when you come to take a bite, you laugh. You see, someone has switched your packet of biscuits with a joke pack, and in fact these are fake ones made of wood. You put them down, still chortling, and check carefully; ask around as to who the trickster was and so on. Then realisation dawns. These are no joke. Gingerly you try taking another bite; you hold the biscuit between your teeth and pull down in an attempt to break off a mouthful. Amazingly, despite gripping with the full extent of your jaw muscles and heaving with all your might, you are unable to get the NSW Ginger Nut to yield. You take if from your mouth and it looks completely unharmed, without so much as a scratch or an indentation from your teeth. They really are quite extraordinary. Being of a sometimes scientific bent, your intrepid correspondent has put the NSW Ginger Nut to the test to discover just what the Ultimate Tensile Strength of Ginger Nut material is. This is done with the Three Point Flexural test. Unfortunately the the industrial flexural test rig I keep in the garage for just such occasions wasn’t working on this day, so instead I had to improvise using cocktail sticks and some heavy weights. I rested the NSW Ginger Nut on a cocktail stick, and held it down on one side, like a see-saw with only one person on it. I then piled weights on the other side, starting with a heavy board and then adding more weight on top. 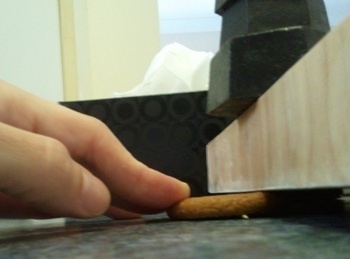 By keeping the first side down, I was able to measure how much force had to be applied before the biscuit suffered brittle ultimate failure. Amazingly, the biscuit was able to withstand forces of over 50 Newtons (represented by over 5kg of weights piled on the top). This is I think a testament to the bakers at Arnott’s; clearly this is a material that has few manufacturing flaws. where x is the strength, k the cross-section area, e the force applied and lambda the coefficient of gingeryness. As you can see, this places the NSW Ginger Nut ahead of both glass and concrete, but still less strong than wood – so it seems the comparison to a wooden disc is an unfair one. Still, with a greater strength than both glass and concrete it does occur to me that rather than building skyscrapers in the conventional way, Arnott’s could simply bake them instead. Much more environmentally friendly, and who wouldn’t enjoy working in an office imbued with a lovely gingery aroma? I do like the NSW Ginger Nut. It is a unique product that requires a sort of karate-like skill to bite into. It also dunks beautifully; there is very little danger of getting crumbs in your tea with the NSW Ginger Nut as it can withstand the hot tea almost indefinitely without affecting its structural integrity. Indeed, many people contend that this is the only way to truly enjoy them; the hot tea softening the biscuit and enhancing the flavour ‘not unlike a fine red which releases its best when decanted’ (as one of my correspondents put it). I’m going to give these an eight out of ten, plus a bonus point for being so marvellously uncompromising. No wonder the non-NSW residents of Australia rebelled when faced with such a tough opponent! Dear Chilli, a fitting tribute to the Lionel Rose of biscuits. Tough, uncompromising and world-class. I recently tried a pack of Victorian GingerNuts. These are thinner, nowhere near as challenging and perhaps not worthy of the Nut label – they’re quite easy to crack. This may be because they reflect genteel Victorian sensibilities, rather than the more pugnacious NSW persona. Thanks for this long-awaited and insightful review. It’s a beaut. Tougher than marble eh? I can imagine the Venus de Milo in GingerNut. Perhaps not. crying with laughter. This is fantastic. I’ve now tried the Gold & Black Gingernut Biscuit and dammit, they’re actually better than either the Victorian or Queensland Arnotts version. These little suckers are rock-hard and contain 2% ground ginger – very tasty indeed. Don’t know their physical strength, but they must rival the NSW Gingernut. I suspect they’re made by a former Arnotts rival or stonemason. As I just had some work done on my front teeth I tackled these with my molars rather than risk splitting the new porcelain – wise decision, as these little granite discs took some cracking even with the big guns. Not a bad effort from a local supermarket brand. At last I’m glad to see that the rock hard Ginger Nut is still available. I grew up on them in Sydney but when I moved to QLD I thought Arnotts had changed the recipe. Will have to get some friends in Sydney to post some up for me. Thanks guy’s. We are travelling through north QLD (ex NSW) and have had the unfortunate exposure to what we now believe is the feared “QLD Gingernut” , I was writing this to complain about the recipe change, but now I find you do 4 recipes, you are forgiven! Do not change the NSW biscuit please. Most recipes do not have the rockhard quality that should distinguish ginernuts and are either too soft or brittle. Is a version of the NSW recipe available? Your gingernut observations are wonderful, that is one of the most amusing , and observant descriptions I have read. I work in NSW , but was raised on Q’ld gingernuts. I took samples of both to work, and without exception, the Queenslander was preferred. The stronger ginger taste was the main attraction, and the hardness of the NSW variety was its downfall. Easiest way to tell the difference without tasting, the barcode for NSW biscuit ends in 21, and the Q’ld style ends in 45. Just think of postcodes for the states. I thought I was the only one who noticed that the Ginger Nut has officially gone soft. I’ve been eating the hard bisquit for 45 years. Most factories are making the new soft version, which is un-Australian! I live in Newtown and luckily the local IGA chain is still supplied with the original hard Ginger Nut but Coles & Woolies only sell a soft version. I can’t imagine why Arnotts would change the recipe but have “one” factory continue with the original recipe?? It’s very disappointing. Won’t someone let them know they are destroying one of Australia’s favourite pastimes? When Arnotts were taken over by I believe an American company they did not realise that the biscuits were baked differently for each state. I can’t remember which year this happened but I like many others wrote to then. I understand they actually brought back some of the older Arnotts employees to try and get the biscuits right. But they have systematically just about destroyed most of their line of biscuits. The ginger nuts are not what they used to be, they were slightly thicker and darker in colour and even harder than they are now. Just memories now. LOL….been part of a ‘mission’ to replicate the NSW GN via DIY baking, and we’re having the opposite problem – they come out too hard..!! We’re calling them Ginger Bullets. I too fell foul of the ‘soft’ Ginger Nut, both in QLD and in New Zealand, where Woolies also sell the soft version. Frankly, I think they are mising a trick here, and should relabel the soft version Ginger Snap, and repackage it enough so it is a separate item, then repackage the GN and sell only the harder NSW ‘nut’ version. Guaranteed it would find a market worldwide, as every tea drinker I’ve introduced them to loves them, as they are the ONLY biscuit you can dunk without it suffering terminal collapse. I am ex-NSW. I have been living Cairns for 25 years. I gave up eating gingernuts. My aunty used to send them to me because I couldn’t eat the revolting Qld ones. Earlier this year I went into IGA and bought a packet of gingernuts. I don’t know why. When I opened them I was over the moon! They were NSW gingernuts!! Every time I go to IGA I buy at least three packets in case they suddenly run out. AND I’ve been vegetarian for years and now vegan and to my absolute delight Anotts gingernuts are vegan! No secret nasties in there so I am again very happy! !